Ubuntu 17.04 introduces a swap file to replace swap partitions. However, I would prefer not to have any disk-based swap space at all, so I would like to know how to turn the swap file off. Clarification: I need a way to turn the swap file off permanently. AFAIK, the swapoff command only disables it temporarily. Clarification 2: I do not want swapping disabled completely, as I am using zram as my swap. I only want the swap file disabled. My question specifically deals with the swap file, while the answers to the other questions deal with either turning off the swap partition, or they deal with turning off all swap. I do not want either, I just want the swap file turned off. Now disable the swap file in /etc/fstab. I'm using Vim. After this is done. save your changes and exit. and voila! For the changes to take full effect, reboot the system, and use the 'free' command to confirm there is no available space for swap. 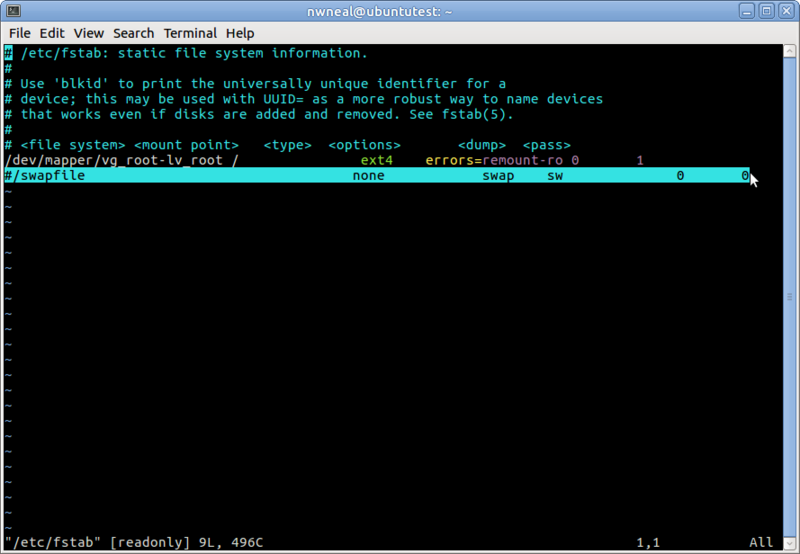 Any swap file or partition that starts at boot is in the /etc/fstab file. If you remove the line associated with that swap file in the fstab it won't start up again after a reboot. Not the answer you're looking for? Browse other questions tagged swap 17.04 or ask your own question. Ubuntu Gnome 17.04 hanging on full memory as swapping starts to happen (swapoff prevents the problem). What to do?